No doubts, one of the best apps I’ve developed was CCleaner Runner – which got the attention of many software websites (in different languages! )such as this, this, and this. 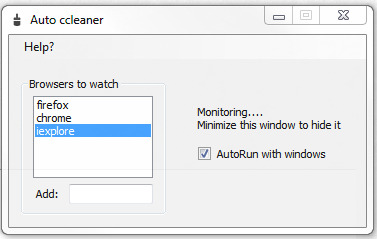 CCleaner is no doubt the best cleaning app out there but one functionality that is missing is to auto clean the browser’s cache, temporary files, history, etc when closed. Many users use CCleaner to clean up their Firefox, Chrome, Opera, Safari, and IE browsers, so why not automate the whole process?